Autumn has just started, but this squirrel has begun early to collect food for the winter. 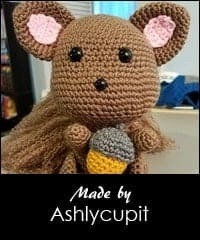 The amigurumi will be about 17 cm tall. eeeep! he is adorable! i totally love him and the tree stump and nuts are an awesome addition! This is so cute. 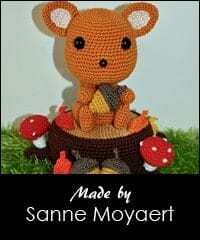 It has so much details with the acorns and mushrooms. The tree stump adds a special touch to it. This is an awesome design. Just beautiful. He is just the sweetest little guy! He made my Monday!! This squirrel is totally adorable! I especially love his mushrooms, acorns and stump. I’m in love! It’s lovely! Special with all the details.
? you are one talented lady. This is the cutest thing ever! This is so cute!. This Squirrel reminds me of my childhood when we camped in the woods while my dad logged during the summer. My brothers and I would feed the Squirrels and try to catch them. We had such fun during those summers 50 yrs ago. Aw thank you! I never got the chance to get close to one. Absolutely Adorable! So much detail! I just yelled out “Oh my!” causing all of my family to rush over and exclaim Awww!!! Just so so so cute!!! Omg il est tellement mignon. Mon fils capote sur les écureuils ces temps-ci ?? Omg! I would love to win this one!! My sister has a fake tree in her toy store that he would look perfect with!! How adorable <3 Creating those patterns is such an art. Doing a good job! Awwwww…..SO sweet!!!! I love the details!! Ooohhhh, wat een lieffie! Echt één van de allerleukste herfstpatronen die ik de laatste tijd heb gezien. Deze zou ik heel graag willen maken en omdat ik maandag geopereerd word heb ik daar in het ziekenhuis en tijdens het herstel ook alle tijd voor! Heel erg bedankt! 🙂 Sterkte met je operatie! This is totally Precious! Especially how you have the tail! It made me happy just to see it, but made me cry too! I just lost my Mom and this is something she would have adored! Thank you so much! It means a lot to me 🙂 I’m sorry for your loss! The tree stump is adorable and really completes the entire project! This is soooooo cute!! I love your patterns, you do a fantastic job.